As we walk across the new, high level bridge we look to the left and see the sun glinting on the river. Another bit of the river appears as the brown spot in lower right part of photo. This part of the valley is overgrown and mostly in a park. 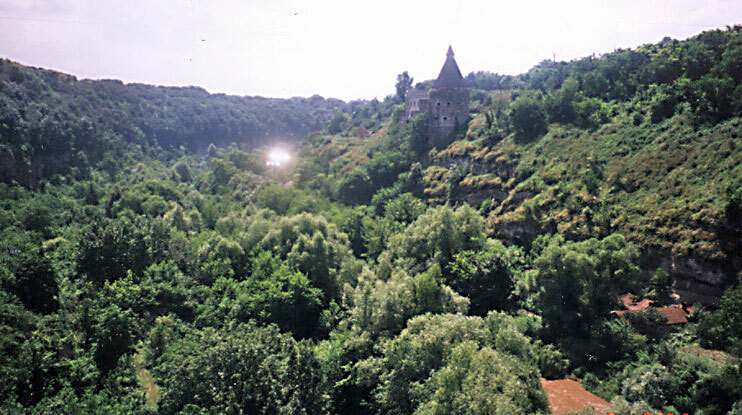 At the crest of the escarpment there is one of the few remaining towers of the city defensive wall, the Riznytska Tower (10 on city plan). Next to it is a restaurant that we will visit later.